As the world adjusts to the huge political shifts that just occurred in North America and Europe, business and industry leaders now find themselves questioning where they are, where they are going, and what they might do next. Many are stumped because the strategies they have had in place are now mostly irrelevant. The latest decisions could quickly change the landscape in such a dramatic way that business and industry leaders may find themselves with few predictable ways forward. This disruption will shake things up so much everyone will be looking for answers. Because the problems are messy, the facts are blurry, and it is difficult to create options, it is difficult to evaluate and plan. If you are thinking, “What can be done?” we are here to assure you there is a lot! If you are trained in LEGO® SERIOUS PLAY® advanced strategy, you are in great shape because you have one of the most powerful tools in your tool kit. Why is this tool so powerful right now, at this very moment in time? Because now more than ever leaders need help to create strategies that are agile, flexible, and adaptable. We are not talking tactics or operations, those plans will fall into place after you have crafted a smart strategy. Going forward, strategy might look like a series of prototyped experiments where you can make corrections on the fly. In our process we gather the facts, scan the external and internal environment, and bring together leading minds to work with 3D tools. People build the current situation so they can physically see what is on their landscape, and they make the connections to the outside agents and forces that are impacting their industry. All elements are constructed and deconstructed as new information emerges. The process brings everything back into focus so we can craft a strategy and then test it, preparing to boldly go into this unpredictable environment with confidence. AGILE enough to move quickly and take advantage of market opportunities, as they are there. FLEXIBLE enough to continually be correctable with small if any consequences, with low risk. ADAPTABLE enough to respond and change where needed as new information unfolds. With applied creative thinking and powerful strategy frameworks, you can facilitate workshops that have the power to transform organizations and enable them to not only have sustainable futures during times when nothing is predictable, but to thrive and grow and take market share from those who are less nimble. Your clients are counting on you to help them create sustainable strategies to out-imagine their competitors. 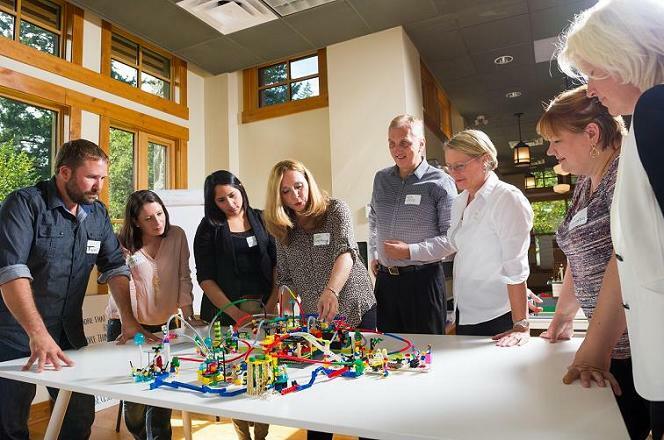 If you have previous LEGO® SERIOUS PLAY® training and certification, join us for one of our advanced strategy courses that will change your practice. If you are new to LEGO® SERIOUS PLAY®, this is the perfect time to get your certification. Check out the classes we are offering right now!